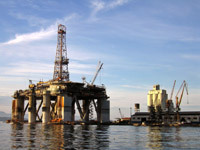 After spending more than $2.5 billion on drilling rights in U.S. arctic waters, Royal Dutch Shell Plc, ConocoPhillips, Statoil, Iona Energy Inc, and other big oil companies are quietly letting go of projects once claimed to be the next big discovery for the oil industry. Crude oil prices have fallen to less than half of where they were in June 2014, forcing oil companies to cut spending. Shell and ConocoPhillips, decided to formally abandon arctic land claims before a May 1 due date to pay the U.S. government millions of dollars in rent to keep holdings in the Chukchi Sea north of Alaska. The U.S. Arctic is estimated to hold 27 billion barrels of oil and 132 trillion cubic feet of natural gas, but energy companies have struggled to tap resources buried below icy waters at the top of the globe. Big oil companies have relinquished 2.2 million acres of drilling rights in the Chukchi Sea -- nearly 80 percent of the leases they bought from the U.S. government in a 2008 auction. Oil companies spent more than $2.6 billion buying up 2.8 million acres in the Chukchi Sea during the 2008 sale. This after spending millions on exploration claims in the Beaufort Sea. The high costs of working in the Arctic means it is generally attractive only to large oil companies.